Recently you guys have been requesting information on how to make your ceramic work more environmentally aware. Therefore, I am writing my first blog post about Raw Firing as is a great technique for cutting energy usage. I hope that you all have fun experimenting with this process, please feel free to send me the results! Raw Glazing is when you apply glaze onto greenware and then fire the work in the kiln once (skipping the bisque firing). This traditional method of glazing pottery is a more environmentally sustainable approach as it saves energy in kiln firing, not to mention saving time and money. Make sure that your greenware is completely dry before applying glaze, this reduces the risk of the glaze cracking. Be careful when you are handling your greenware! Obvious I know, but greenware is much more fragile than bisque and it is upsetting when things break. It is very important to slowly heat up your kiln to avoid the clay shrinking too quickly. As the greenware will shrink a lot in the kiln firing, Raw Glazes must have a high clay content. Otherwise your glaze may craze or crack off. 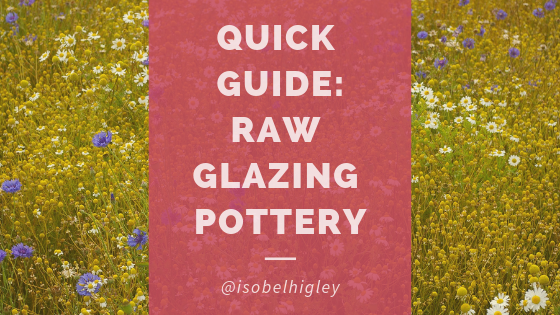 Below I have included my user-friendly Raw Glaze Recipe, suitable for Stoneware. This glaze can be used as a base glaze for colorants and added textures. When I use this glaze within my work it normally has a satin-matt finish, depending on the type of clay used.